TomTom may be king of the satnavs, but its crown it also prone to slipping occasionally. Then the TomTom GO 920 Traffic proved competent enough but lacked any real killer features that separated it out from the rest of crowded satnav market. Indeed we concluded that the Garmin nuvi 770 had a better balance of features. That changed with the arrival of the TomTom GO 930 Traffic - the £350 replacement for the 920 Traffic (aka the 920 T) that crucially adds some much needed features. Chief of these is a new Advanced Lane Guidance system which gives you detailed information about which lane you need to be in when approaching junctions on motorways, etc. It's joined by IQ Routes - an intelligent route plotting system that takes into account local road conditions like average vehicle speeds, likely congestion during the working week and weekends, etc, and the presence of roundabouts, traffic lights, etc. Team that with the TomTom GO 930 T's build in Traffic Message Channel (TMC) Traffic Receiver and MapShare - which enables TomTom owners to share on-the-spot route info. Result? Smoother journeys, a great deal less frustration, calmer passengers and crew. Or at least that's the theory... more on this in a minute. In use, the TomTom GO 930 Traffic (or 930 T) builds on the success of its predecessors, with an easy-to-read 4.3-inch widescreen display. 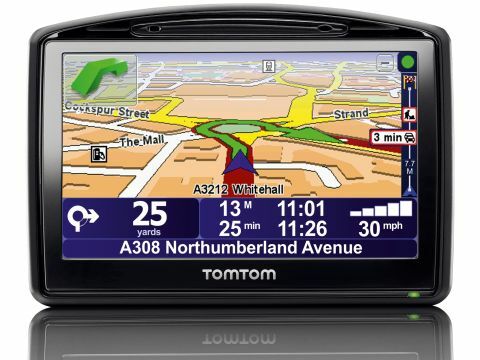 TomTom has also tweaked the user interface to make accessing various features more logical - another notable improvement over the TomTom GO 920 T.
You also get a system remote control, 12v charger and 4GB of RAM - or enough room to store 35 country maps, that encompass Western and Eastern Europe, North America and Russia. Unlike TomTom satnavs of yore, we also found that the GO 930 T was easily able to connect and hold onto a mobile phone its paired with via Bluetooth, and you can easily set how frequently your phone calls for updated traffic info en route. The biggest downer is that the TomTom GO 930 T won't yet work with the iPhone - although that's down to the iPhone's [deliberately] limited Bluetooth set-up rather than anything else. It's out on the road though that the new features of the TomTom GO 930 T really comes into their own. Although we were a little sceptical at first, IQ Routes really does seem to work, helping us get from home to our destination using a mixture of country lanes, dual carriageways and motorways with the minimum of fuss. It surprised us really only once - when it forced us onto a rat run through a village during a Friday rush hour peak rather than keeping us on the main route. We really like the new Advanced Lane Guidance feature too. It makes tackling motorway junctions and roundabouts less stressful, especially in heavy traffic. However we also found that the amount of notice it gave us varied enormously: on some junctions we got plenty of warning, while on others - the notoriously complicated M4 / M5 interchange outside Bristol, for example - we hardly got any notice at all. We expect this to be improved in future. If the TomTom GO 930 T has any irritating foibles it's these: TomTom's voice instructions can still serve up confusing route number names. It reads the A46 for example as the A forty-six, fair enough, but then offers the A350 as the A three-hundred and fifty when most of us would prefer it to be called the A three fifty - the latter is less ambiguous, and easier to understand when approaching junctions. Understanding the instructions isn't necessarily helped by the 930 T's built-in speaker, which can sound distorted at times. The other annoyance is the night time illumination feature. Like all other TomTom devices, the GO 930 T is supposed to automatically switch to a night time map whenever you switch on your car lights. It does this by measuring the amount of ambient light using a day / night sensor. However this didn't work at all in our test car. We suspect that recent builds of the TomTom GO software may be to blame. We discovered the same problem afflicted our ancient TomTom GO 700 after a software update. It worked perfectly before. However these are minor niggles. The GO 930 T is easily one of the most accomplished satnavs TomTom has made and with genuinely useful features like IQ Routes, it's proved it can still innovate and stay ahead of the pack.